Enter a function f(x) in the input box. Choose an attribute dectector - either value of f(x) or slope of f(x) Start and/or stop the animation by clicking the buttons the f(x) detector will be red when f(x) < 0 and green otherwise the f'(x) detector will be red when f'(x) < 0 and green otherwise [N.B. 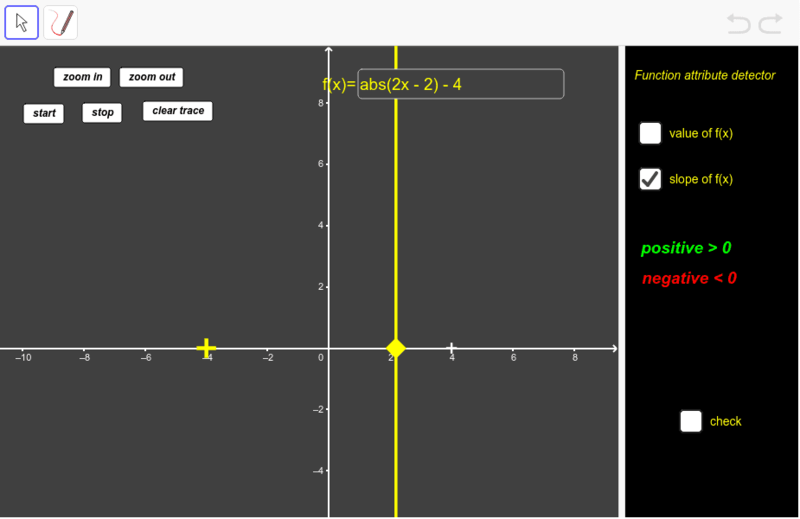 You can set the range of the animation sweep by dragging the yellow plus sign on the x axis.] Use these data you collect to sketch f(x) and f'(x). To do so click on the pen icon in the toolbar and then draw. [You can clear your sketch by clicking on the 'reset' icon in the upper right hand corner of the left panel.] You can check the accuracy of your sketch be clicking the 'check' box in the right hand panel. What questions could / would you put to your students based on this applet?